I’ve had to battle a bit with these two. USC’s Adoree’ Jackson is arguably the most athletic player in college football — but until recently he was the guy with major potential rather than someone who mastered his craft at a set position. His instinct, technique and recognition skills have long appeared to be a work in progress. When he can just show off his extreme speed and twitchy athleticism — he looks incredible. That’s what you see when he returns kicks and he can just fly — he averaged 30.5 yards on kick-offs in 2016 (scoring twice) and managed 302 punt yards (with a further score). I’ve been reluctant to grade him much higher than a second rounder with potential to get into the first frame — but he had four interceptions at cornerback this year and I wanted to go back and review his play towards the end of the season. Jackson has certainly made improvements in terms of recognition and there were a couple of plays where he mirrored the receiver perfectly and was in position to play the ball almost as the intended receiver. His elite speed and recovery ability frequently put him in position to make a play on the ball. He can go deep and cover a guy like John Ross, but he was also exceptional at covering ground quickly even when he lost initial leverage. There were clear improvements compared to his 2015 tape and the early 2016 stuff. In terms of pure potential and upside — he’s right up there. His size (5-11, 185lbs) might prevent him from going too early but he’s a candidate for round one. No doubt about that. He might actually suit a switch to safety where he can play deep, read the play and react. His closing speed is special and he’ll cover ground very quickly. You’re also putting him in space where he can really show off his athleticism. At corner there’s a chance he’ll get manhandled at the line or overpowered playing the ball. At safety you’re probably maxing out his athleticism and range. Alternatively he could be a full-time slot corner (an important position these days) or a bit of a jack-of-all-trades (slot, outside corner, FS, some offense). However you’d have to be a good team drafting him in round one to justify taking a ‘Mr. Versatile’. One thing is for sure — he can have an immediate impact on special teams. Jackson truly is one of the best returners you’ll ever see. He glides — and somehow manages to turn any kind of kick into a big return. He will dictate game plans and win you field position because teams will waste time during the week working out how to avoid kicking him the ball. We’ve talked about Seattle’s needs and a cornerback isn’t really a high priority. The Seahawks have also avoided early picks at corner and let’s be honest — is that really likely to change any time soon? That said, they also love love love special athletes with limitless upside. Jackson has that in his locker. The Seahawks love to get their hands on extreme potential and coach it up. If they see a DB with exceptional, unique upside and grit — they’ll be interested. It’s very easy to imagine Adoree’ Jackson being on their radar — especially with his major flair for special teams. So while the chances might be slim that he lands in Seattle, you just never know. It’ll be really fun to watch him at the combine (assuming he declares). Speaking of the combine, there are few players I want to see perform more than Texas running back D’Onta Foreman. The more I watch, the more I want to buy into him. I’m sceptical that he’s the listed 249lbs. He’s probably more like 235-240lbs. Yet his lateral ability and suddenness at that size is impressive. And while he’s faced a collection of truly horrendous defenses this year — it’s still not easy for guys his size to run away from defensive backs (which he does quite regularly). It’s the opponents he’s faced that bothers me. The Big 12 is a total joke show when it comes to defense. It’s getting worse every year. 300-yard rushing performances are not a surprise anymore — and it’s hard to be that impressed when Foreman, Samaje Perine and Joe Mixon run all over teams like Texas Tech. Foreman’s out-of-conference opponents really only add to the problem. Texas faced Cal’s laughably bad defense, Notre Dame’s isn’t much better in 2016 and he didn’t play against UTEP. It’s hard to knock a 2028-yard, 15-touchdown season — but this is probably the least challenging 2028-yard, 15-touchdown season you’ll ever see. It feels really strange writing that. Nevertheless, there’s nothing else to judge him on. Texas aren’t Bowl eligible so he’s done now. College career over. I’ve seen comparisons on Twitter to Marshawn Lynch and Jonathan Stewart. Lynch is unique and really nobody should ever be compared to him. People forget he was only 215lbs at his combine. Lynch played with the power of a 260lber at 215lbs. He was rare and should be a Hall of Famer. There will never be another Marshawn. Stewart ran a 4.46 at 235lbs (Lynch also had a 4.46 funnily enough). Let’s see if Foreman can match that because physically they look quite similar and play with a similar attitude. We know Pete Carroll likes Stewart — he makes reference to it every time the Seahawks play Carolina (which has been quite often over the years). It’s also worth noting that both Lynch and Stewart went in the top-15. If Foreman runs in the 4.4’s there’s every chance he’ll go that early too. He does hit the LOS with authority and you can lean on him, as Texas often did, to carry the load. Yet it’s his ability to bounce outside and hit the home run that is so impressive for a player with his size. A big back rarely has that ability to be explosive and sudden. Foreman has that. I just wish he had the chance to prove he can do it against LSU or a similar opponent. The Seahawks could easily be in the market for a new runner to add to their collection. I can imagine the Seahawks liking him. His personality is pretty cool — kind of chilled out but with a hint of serious in there too. However, they need to do something to make sure they have a consistent run-game in 2017. This is the identity of the team we’re talking about. Tough running, physical play, great defense, point guard quarterback. If they really like Foreman — and considering the injury problems with Thomas Rawls and C.J. Prosise this year — this could be a possibility. Let’s see how he performs at the combine (and let’s especially hope he runs the forty). Having said all this, when Pete Carroll recently referenced his ideal running back would have Thomas Rawls’ style at 240lbs — it’s hard not to think of this guy first and foremost. For reasons aside from the obvious, hopefully Rawls stays healthy to finish out the season and playoffs. It’s a good window to evaluate where Rawls is, and how the O-line continues to function. If both look much closer to the Car game vs the TB game, the front office would likely be hard-pressed to use a 1st on a RB, especially with Prosise back and other potential needs (R tackle, D line, etc). I mostly agree — but also worth noting a couple of counters. Firstly, the injuries suffered by Rawls and Prosise have been lengthy and consistent enough to plant a seed of doubt that won’t be eliminated in four remaining regular season games. If they love Foreman — it could be a possibility they take him early. Add to the stable, commit to those three and feel somewhat comfortable about the position barring a sensational piece of misfortune. Secondly, it comes down to the other options available. What if Bolles doesn’t declare or goes top-20? What if other possible RT’s don’t emerge? What if the top D-liners go early and the value isn’t there? Just a few things to consider. All true. I could definitely see it as a consideration depending on how the first round unfolds. I just suspect they think Rawls is their guy, that injuries are somewhat flukey (not like it’s a chronic-type thing), and they are so big on Value that they’d rather attempt to plug another hole or trade back to acquire picks and then take another RB later. I agree Sdcoug Rawls is our guy! Love him as a player and as person. He’s exciting and explosive as a runner while being a great kid with all his exuberance. Love, love Rawls, may he stay healthy for ever! Foreman also puts the ball on the ground a fair amount. 6 fumbles this year. Granted he had over 300 touches. I wasn’t aware of that. Six fumbles is a concern. Prosise had 5 last year, Collins had 17 in 3 years while losing 9. That was a knock on C-Mike coming out because he went away from contact. That should be a fixable issue. Good post! I like reading about the non-conventional options, even if the chancse of them wearing blue & green on Sunday’s is unlikely. Rob – what versatile, all-around backs could be targets in the middle rounds (3-5) in your opinion? I believe a versatile back with skills in all facets would be ideal, since Rawls and Prosise bring very different skill sets to the table, and there’s no telling which one could get injured first. I like the idea of adding a third wheel who could potentially fill the role of either Rawls or Prosise if/when one gets hurt. I still think Elijah Hood is a good option for that role you describe. Rob what do you think of Perrine as a big back to compliment Rawls and Prosise? Gets banged up too much for my liking. Has good and bad games. Runs vs the Big 12 defenses. Things I like but not blown away. I’d take Jamaal Williams as a compliment back. Word is he is rising, but he should be there in that range. His running style would compliment what we have with Rawls and Prosise perfectly. Whoever drafts Hood is getting a steal. He might be the best tester or this class. What about De’Veon Smith of Michigan? He seems like a really nice pick for us. He is a bit on the heavier side: 5-11, 228lb. But watching his games, he can pass pro, he has good vision, good cuts, always tries to get those extra yards. Maybe we get him in the 4th-5th round? Wasn’t blown away in the Michigan games I watched but not truly focused on him specifically. Last year I was sure (as were most of us) that we would draft OL in the first round. The only surprise to me in the first 3 rounds was Nick Vannett. This year I don’t have as clear an idea of where PCJS will go in round 1. I think Odiambo has looked good in his limited time on the field. Is he potentially a starting tackle? Or the guard that will push Ifedi out to RT? I wouldn’t be surprised with OL, DT, DE, LB, or RB in round 1. Heck it wouldn’t surprise me to see us go after a shocker like WR Corey Davis! Size, speed, and production! As usual, it will be fun to see where we end up. Did Lynch perform at his pro day? Because at the combine he ran a 4.52. That’s weird. On draftscout.com its 4.52. I wonder if those were pre-draft measurables. Another great write up Rob. So glad you took a closer look at Adoree Jackson. I posted about him earlier today and while incredible raw I think he is the most dynamic athlete in CFB. Do you think with his speed and range is he a guy you could bring in as an insurance policy for Earl and train as a hybrid safety / slot corner if Earl comes back as I fully expect next year? He has the speed but my question is whether he is physical enough. What makes Earl so rare is that he is like a missile and hits like a much bigger guy. Ask Gronk. Worst case scenario with Jackson would be a development potentially shut down slot corner with incredible special team value. A tandem of he an Locket would be the best in the league and help keep Locket healthy. If Bolles and Walker are off the board when we pick I would love Jackson as the pick or Foreman if he can run a sub 4.5. Both are productive and truly unique players which we know the Hawks love! I don’t think they’d take an insurance pick in R1. If they draft him it’s because they believe he can have an immediate impact somewhere, or develop into a key contributor by year two. I agree, he doesn’t look 249. Probably closer to what you said. None the less the guys a beast. Also anyone havin trouble submitting a comment lately? I’m not seeing g the submit comment tab anymore. Hey Greg when that happens just push the bottom left arrow which is “Back” on your phone and it will appear. Figured that out awhile ago. Thanks Vol for your post on the teams the Hawks have scouted multiple times. Greatly appreciated! Who are the potential prospects at the small schools Ark St. and Old Dominion? Hard to say, but let me take a couple shots in the dark here. Arkansas St? S Cody Brown, DE Chris Odom. Old Dominion? WR Zach Pascal. I like him a lot. Very athletic. Thanks will add them to the list to try and checkout. I am late getting started this year but wow looks like another deep draft and the defensive side of the ball is loaded. Best Safety /CB class I have seen at least so far. I was pretty impressed with Pope in the last game against the Panther’s. Truth is if all 3 of Rawls, Prosise, and Pope were always healthy it wouldn’t be a conversation point on our Awesome blog. Foreman is special to me because at his size he has home run speed although as Rob stated again he play’s against week teams more often then not defensively. Also with Mixon he might end up being an UDFA just like Thomas Rawls, what a deal that would be! Still hoping for Bolles RD 1 because another piece to our Offense Line Chess Board is inevitable. Sowell is doing fine right now but we still need to sign him and he might be better suited as our back up tackle. Foreman, Mixon, Perine, Hood, and U-Dubs Lavon Coleman are still my hopes to be a running back on this team come next year. Have to say I agree. Lots of great options but if they can lock up that RT spot this OL has the chance to go from one of the worst to one of the best in the next couple of years with Cable, Continuity and Experience. I truly believe Britt Ifedi and Fant all have the potential to be elite at their position in another year or two. Glowinski is solid so the only weak link projecting next year is RT assuming you keep Rees as a swing guy. Love a bunch of other prospects like Demarcus Walker and Adoree Jackson but if Bolles is there much like Ifedi last year he just makes too much sense. What’s cool about this draft, they’ll get a good RB to add to the stable no matter what. I agree. Really hoping Coleman declares. He could be the steal of the draft at RB. Dude runs like a Seahawk back. And if Seattle feels all they need is that 3rd guy to handle 15 carries or so due to an injury, Coleman makes even more sense. I agree 100% Vol. I think the hawks really like what they have in Rawls and Prosise but are rightfully concerned about durability. So basically they are drafting a guy to add to a rotation to those guys that is why I would love to see a big powerful RB who can be used in short yardage and goal line situations. A Corey Blount type guy ideally. I don’t think Coleman will declare as he could probably boost his stock with a another year in College as lead dog but if he does he would be the ideal pick IMO I love the pad level and leverage he plays with and would be an ideal addition with Rawls and Prosise. I like Coleman a lot. Not only a good running back but also is good at pass protection and cut blocks. I just re watched Sundays game and not sure if I am imagining things but Michael Bennett really did not look like himself. He almost seemed disinterested which is so unlike him. When they showed him on the sideline almost looked like he was emotionless. It seemed really weird. I hope that the ongoing contract negotiations which were supposedly heating up have not pissed him off because that is one guy we need 100% and engaged now that Earl is out. Anyone else notice this or am I imagining it? I was really hoping we might hear before the playoffs that Bennett, Kam and Avril all got 2 yr extensions. Similar to before the SB run when some guys got signed. Seems a little unlikely now. Avril is not a candidate for an extension with 2 years remaining on his contract unless the FO has changed their standard operating procedure. I noticed it also. I thought he was still hurting from his knee injury, since I saw him limping a little on the side line. I think he was a little down because he is not at full health yet. I saw it too. He flashed at first, then played very quietly after that. Before his injury, he was playing with reckless abandon play-in, play-out. Perhaps he is making a business decision to be a bit more careful and pick his battles, perhaps he was only able to ease his way back in. Probably a bit of both. Regardless, he’s earned the respect of every fan and teammate with his non-stop motor, his intensity, and his fearlessness despite being pissed at his far-below market contract, so Im not going to think anything but the best of him unless and until he appears to dog it for several games in a row. Im betting he feels better this week and you see him get close to the level he was playing at vs Atlanta. But I bet you he’s going to have his head on a swivel more, and be watching for those nasty low blocks. I dont mind, last thing I want to see is him get hurt again. He doenst have to blow up every play to totally disrupt how an offense operates, and he will command double teams often enough it should help guys like Avril and Clark get more sacks too. PC mentioned in his press conference (I think) that Bennett was on a pitch count last week. He has no restrictions this week. Have to think they try to lock him up with an extension. Just a thought, would this influence their direction in the 1st/2nd round? They run scenarios that would include a raise for Britt. He’s going to get one imo. What I am interested to see is who they bring in from outside, if anyone, for the OL. If Bennett and Chancellor are also getting extensions in addition to Britt how much moolah is left to play with? I hope they are giving some thoughts to paying all of the members of the offensive line that makes it past their rookie contracts. I’m tired of the constant rotation of players and positions. How would it affect the payroll if they found the right players and gave 4 of them contracts in the 4-5 million dollar range? With the 5 th guy being the rookie. That 16 to 20 million dedicated to the offensive line could be enough to provide a more consistent offense. That’s easier said than done Alaska. They have to warrant the contracts. There’s no point paying guys $5m a year that aren’t worth it. Do you realise that Bennett and Avril are earning $7.2m a year each? Paying your O-line guys $5m a year if they aren’t worth the money would be a major mistake — the type of mistake we know this front office won’t make and we should work to understand some of the decisions they’ve already made on the O-line. Yeah. Okung and Sweezy definitely aren’t meriting the contracts they’ve received out on the open market. Sweezy especially. If they had been paid by the Hawks we’d still be talking about how the OL needs more investment. Exactly. And it would’ve likely cost them other players. As much as people want to knock Lane at the moment — good luck finding someone to play nickel corner in 2016 if you paid Sweezy. It doesn’t have to be 5 million, it just needs to be enough to keep them on longer contracts. The real question is do they move from minimum wages to paying something more for long term performance. And if they pay more, how will that affect other areas of the team. They are willing to pay for performance on the defensive line. Why not the offense? I don’t think Okung or Sweezy were the long term answers. I do hear a lot of talk about retaining Britt. Well how much is he worth? I would guess 2-4 million, though some other team may be willing to pay more. Would you be willing to pay 2-4 million for Britt or Glowinsky when their contracts are up? What is the amount the team will pay? I think you’re still missing the point really, Alaska. If a player is good enough to warrant a long extension than you pay them. Personally I think Britt has shown he is among the top center’s in the NFL this year and would happily pay him as much as Sweezy got in Tampa Bay to secure him for the long term. That’s my take. I had no interest in re-signing Sweezy for the money he got though. And that’s how you have to judge every case. What is a player being offered on the open market? Do we feel said player is worth that type of money? That is all the Seahawks are doing. They don’t have an amount of money they’re unwilling to pay. It’s purely and simply about market value matching the teams value. They haven’t gone out of their way to deliver a cheap OL. They just haven’t felt the players on the roster were worth the money they were getting elsewhere. So they’ve moved on and reinvested using the draft. Paying players for the sake of it is a surefire way to make this roster pretty crappy pretty quickly. The thing I love about Foreman, besides his obvious talent, this kid is a competitor. He leaves it all on the field and literally tried to carry this team for former HC Charlie Strong. Very cool story here too. Not to mention, he didn’t have one bad game. Not one. Big 12 defenses or not, that’s consistency. Here’s a D Foreman highlight reel. Have you seen anything on Elijah McGuire running back out of Lafayette? His size profile is interesting 5’9 210 has some Dixon comps. Great hands- runs real routes as a RB. Phyical, and patient. Needs to be more decisive. Sometimes he’s too patient and gets whacked behind the line waiting for something to open. Short list of late round guys for me. He kinda reminds me of a young fred jackson. Another small school sleeper RB is Marlon Mack USF. Yes I like him as well kind of smaller than preferred but I like him and de’veon Smith as my favorite day 3 backs Smith best back at pass protection in this draft. I feel like I get enamoured with a new prospect every time rob puts out an article. I’m not a fan of bolles in that I’m worried how he will be at the next Elle el. Grown man strength is best shown in the trenches against them young pups. But I just was blown away by adoree Jackson. I know it’s a highlight reel but the guy is electric. I would even have him play some offense on certain plays. Maybe a double jet sweep with him and Locket or a jet sweeep with him or locket while the other sits on a bubble screen. I mean, the speed is insane. Then you have a guy who as rob states, could be best suited at fs where he can use that electric speed to make plays. But he also could be a great slot cb being able to keep up with anyone in the league. I just think that’s a guy that can be used whether earl stays or goes. He can provide excellent depth for fs, while playing the nickle cb spot on the regular. Adoree can immediately be on the field and provide an upgrade at nickle corner. If earl retires(please God I’m begging you no) then we have someone who allows us to keep the defensive scheme the same. He gives great value to st plays. And you can have a gadget player on offense. Speed absolutely kills, and this kid has it in spades. I would say, I’m still in the all in boat for fournette. I know it’s basically not happening. And I love Rawls. But the dude is a generational talent. You get him on this team and I guarantee we aren’t considered a passing team by Pete anymore. The run game would be in full effect and it would be insane. Rob. Glad you looked at adoree and you now see the R1 potential. I’m frankly hoping that they he uses up someone else’s pick and they get not only an athletic prospect but also a nailbiter who is a smart football player. To me, across the team, you see stars who have it physically but also have the grit, passion and smarts. So far IMO of the guys you’ve reviewed only Fournette & Bolles fit the profile in R1. Something that stood out to me about Adoree Jackson when USC played the Huskies was how he baited and punked Browning into throwing an interception. The highest drafted corner PC/JS has ever taken was Walter Thurmond, a nickel corner in Seattle, who eventually transitioned well at safety for Philly. If ET is seriously considering retirement, this guy has to be on the list of ones to watch. Rob – I kinda find Foreman’s comments at his press conference a little non-Seahawky. He was asked about who he wanted to play for and answered whoever had a bunch of money to give him. While not a bid deal, it does hint that he doesn’t love the game as much as what it does for him. That has always been a red flag for PC/JS. Thoughts? I watched the press conference and that remark, in fairness, was said with a clear intent to be a joke. I didn’t read it as a guy who doesn’t care about the game, more just a player comfortable cracking a joke in that setting. And let’s be right here, Seattle’s roster is full of players that wanted a bunch of money. Bennett’s constant threats to hold out, Kam’s hold out, Wilson nearly started last season without a deal. Marshawn was constantly quibbling about his deal. I think they see it as part of the business. What they love more than anything is grit and if you check out the link Volume 12 posted earlier, it’s clear Foreman has that in droves. Rob – I agree with you that if SEA goes offense in the first round it will be in relation to improving the run game. However, we both know that SEA likes to pick players in R1 with freaky athleticism and a high ceiling. The more and more I think about it, the more OJ Howard seems like a perfect fit for both of these qualities. Imagine having Jimmy, OJ, and Nick V as the TEs for this team. Immediately, you’d have three unique TEs that could help the Oline while also providing speed and a red zone threat. His tape against A&M is simply amazing. Do you think you could do a piece on him? Love Howards potential but man is he inconsistent. That may be a result of system and QB play though. He is a freak athlete though and at the end of Rd #1 would be a steal. I think he will be a top 15 pick. Personally I think he’ll be off the board before Seattle’s pick. Probably a top-20 guy, maybe top-15. I think with the way Graham has played, the Vannett pick and the possibility of Luke Willson returning — TE might be pushed to the back of the list of possible needs. Wouldn’t rule it out 100% because there are some good ones in this class, but for me the primary needs are RT, DT or inside/out rusher, RB depth. Rob I am a huge Demarcus Walker fan and think he can be a Michael Bennett type clone. He would be a perfect addition to our DL IMO. I know you like him and have him ranked high but when I look at all the national pundits and their mocks I often see him at the very end of Rd #1 or not at all. He is a great leader, has production, awesome tape etc. what am I missing from a scouting standpoint. Why is this guy not considered a top 15 pick? Would love you insight as to what Scouts see as his weaknesses as I don’t see many. Also if Bolles is gone and the Hawks decide to go DL if Walker is on the board do you think the Hawks would consider him? I think it’s just a bad job on the behalf of the national pundits. The guy is an ideal combo of intensity, hand technique, power and production. He plays every snap. I do think the Seahawks would consider him, depending on how he tests. Let’s say he is a 0.25 to 0.75 on the SPARQ scale, would Seattle have to take him in the first round? If the game tape shows he is a nice fit, I’m not seeing how the testing would preclude them from taking him, unless he totally “craps the bed” at the combine. Even then, I could see a private workout showing them what they need to see, in addition to his previously mentioned game tape. I think they require a certain degree of physical profile if we’re talking R1. 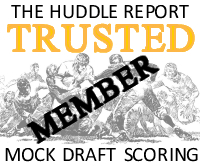 There are likely exceptions — they stated they had Jarran Reed graded in R1 for example. They still took the hulking, incredible physical specimen that is Germain Ifedi instead. So if he tests below the ideal — it doesn’t preclude him from being taken. But if there are others with a greater ceiling, a similar grade and at a position of need, it hurts him. Anyone think we take a developmental QB later in this draft this draft? One guy I really like is Mason Rudolph from Ok St. He has a ton of physical ability and is mobile with a big arm. Has a problem with overthrows and needs some work on mechanics but seems like a great project to work behind Russ unless the Hawks are sold on Boykin. Also like Mahomes and Falk to a lesser degree. If we’re talking developmental QB’s you have to include Seth Russell. I like Mahomes. That kid has ‘it.’ Love that he has a baseball background too. He can throw off balance, from different platforms, thread the needle, and I suspect he might test similar to what Kaepernick did. Would love to see a guy like Sean Payton get ahold of him and learn for a 1-2 under Drew. Brees. I wonder what Jackson’s short shuttle is going to be. He’s beautiful to watch, long speed, silky smooth, makes the game slow down around him. A bit like Tyler Lockett actually, only bigger and faster. His lateral agility doesn’t really show up though, and I wonder if he’s got it. Has a little bit of Jaylen Ramsey about him? I’d love to see him turned into a Free Safety, you can’t teach that sort of range. I thoguht it was interesting that earlier today, I believe it was PC who mentioned the RBs were not being patient earlier in the season. Then when they were hitting the hole(s), they were consistantly making the wrong read. Even then, they were not making plays out of nothing or more than what the offense was giving them (OL specifically). Then last week, Rawls made very good reads and then exploded through the hole…. making tacklers miss and getting nice yards after contact. So, perhaps the OL was only 40% of the problem and the RBs were the real issue earlier in the season. Maybe this was pointing the finger at Micheal….. but this shows me that the Seahawks are going to be looking for 1 or 2 RBs in the draft. 1 early and 1 late. This is my read of course….. So the priority should be RG/RT, RB and DL with the first 4 picks. If you look at the draft board… fill in the blanks..
That’s how I would read the situation, no question. RT, RB, DL. The priorities at the moment. I was mentioning earlier in the Blog Bennett just seems off attitude wise since coming back from the injury. I really hope he bounces back this week as it is critical to any sort of SB run. This is what he said to the Green Bay Media today. Found it odd because he usually very complimentary of Pete and the Hawks organization. I really think they had contract talks while he was hurt and they did not go well. I think this is a bit harsh on Bennett. I didn’t personally see any signs of a bad or passive attitude upon his return from injury last week or during the game. He might’ve been a bit rusty on the field — but that’s to be expected. He only had minor surgery a few weeks ago. As for his remarks on Christine Michael — he’s expressing a point many of Seattle’s players have made in the past. And he’s right in fairness. I don’t think it’s a slur on the Seahawks front office, just a general (and accurate) assessment of how the teams treat players as pawns. I hope you are right Rob because he is one of the leaders on that D and a real emotional guy. He is also a great guy for the young guys to learn from so I hope they can get him locked up to a new deal soon.